If you don't have performance point server on your machine and you are not able to download it below shows how can you do this. Take 3.0 folder, and install the designer on your desktop. Replace localhost:4000 with your server name and click ok.
Then you can click on Refresh to get all the contenct on your designer. Excellent video by Technology Director of Razorfish, he shows how can you build interactive content management portal in sharepoint using jQuery,Ajax,Silverlight and flash ? The video also shows how to enable RIA features/Web 2.0 in your sharepoint enterprise portal using flash and silverlight and social networking. I went through a problem in Sending Email using Email activity in SharePoint, it doesn't work when you try to send email to specific email format using sharepoint designer 2007. 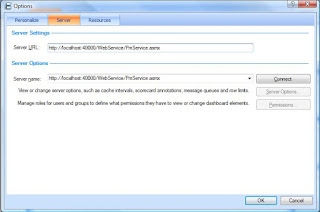 How to control which Silverlight version does your application run on ? I have been asked from one of my colleagues that he developed a Silverlight 2.0 and he doesn't want to upgrade his application to Silverlight 3.0. - minRuntimeVersion: used to control the version of the Silverlight that your application will run on at minimum. For example: if you built your application on version 2.0, the client will not be prompted to install version 3.0 when visiting your website if he has version 2.0 and this attribute is set to use version 3.0.
autoUpgrade: when it is true, the application will be upgraded to the newest Silverlight version automatically. If it is false, noting will happen. - - Before shipping your application make sure that make autoUpgrade to false, unless you developed some features which requires the client to upgrade his Silverlight version to the newest one. - - Set the value of minRuntimeVersion to the version you test your application on, and make sure this is the minimum version you want to make your application is running with no issues. Interested to know more about next version of sharpeoint, here is the site that gives you good information about the new features of Sharepoint 2010 features...check it out. Congratulations! We are pleased to present you with the 2009 Microsoft® MVP Award! This award is given to exceptional technical community leaders who actively share their high quality, real world expertise with others. We appreciate your outstanding contributions in Visual C# technical communities during the past year." Thanks a lot all for your continous support. Wait me for new challenges this year and so on.